In your internet browser (Chrome, Safari, Firefox, Internet Explorer) search app.boardingware.com, enter your username and password and click log in. 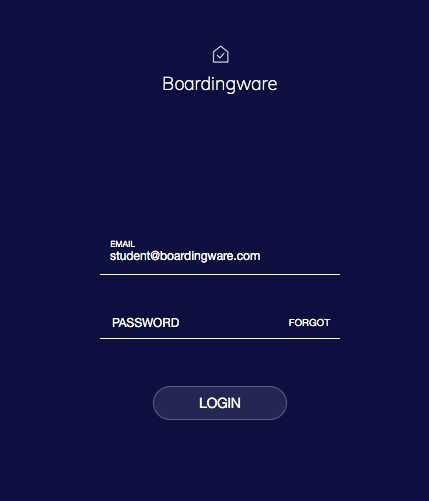 Select the Boardingware Student App from your device's home screen, enter your username and password and tap to login. Don't have the Boardingware Student App on your device? If you have not yet installed the Boardingware Student App on your mobile device, please click here to learn how to download the app. If you have forgotten your password, please click 'Forgot' to the right of the password field. For more detail please review this help guide. Haven't received an invitation to connect to Boardingware yet? Your school is in charge of sending out the account invitations. Unfortunately, for security reasons, Boardingware is unable to do this on behalf of your school. For this reason, we recommend requesting an invitation directly from the school.